In a pan over medium heat, add oil and butter and heat until butter melts. Slice leek lengthwise and chop, white and light green parts only. Add leek and onion to pan. Sauté until softened, 2-3 minutes. Add a pinch of salt and pepper. Add thyme and sauté for another 2-3 minutes. Add garlic. Stir and toss to combine. Continue to sauté until garlic is soft and fragrant, 2-3 minutes. Add spinach and stir until slightly wilted. Add lentils and stir to combine. Sauté for another 2-3 minutes, stirring frequently. Salt and pepper to taste. Remove salad onto a serving plate or bowl. 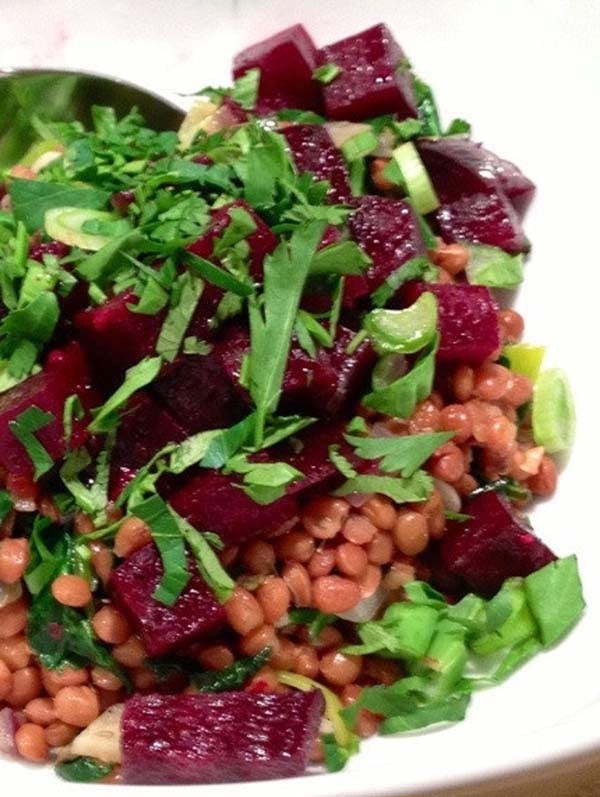 Garnish with roasted beets, scallion and herbs.